Jon's blog: Comments and observations about recent tornado/severe weather cases and issues. 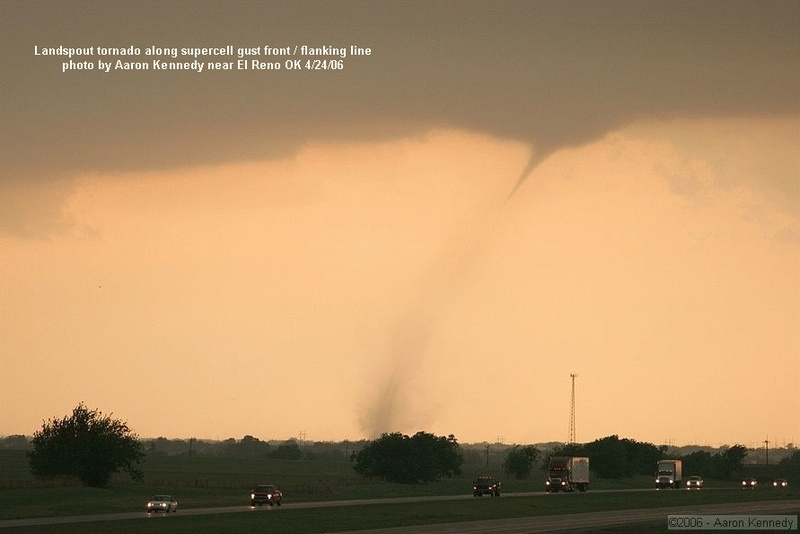 The 27 April 2011 tornado outbreak: A stunning death toll. Wednesday's staggering death toll from a huge outbreak of tornadoes in the southern states was truly historic. We haven't seen anything of this magnitude since 1974's 3-4 April Super Outbreak, 37 years ago. I know that news will tend to focus on the number of tornadoes. But a more important statistic sociologically is the _death toll_, which as I write this (on Thursday morning) is being reported to be well over 200 people and climbing! (Sunday 5/1/11 update: The death toll is now officially at 339, putting the 27 April 2011 outbreak at #3 on the list above, an incredible and tragic event in U.S. history, particularly in our day and age. Notice that all but the 1974 Super Outbreak, the 1965 Palm Sunday Outbreak, and yesterday's outbreak occurred more than 50 years ago when a tornado warning system did not exist. Undoubtedly, the death toll would have been worse without excellent forecasts/warnings by government and private meteorologists (see yesterday's SPC outlook above), and excellent information dissemination by the media. National morning news I watched on Wednesday, such as CNN, was strongly highlighting the dangerous situation to come over the South. However, the number of deaths from Wednesday's outbreak in an age where technology and information exchange are better than ever does raise questions from a sociological standpoint, as my wife Shawna is quick to point out. How many deaths occurred in areas of low-income structures (e.g., mobile homes) where people did not have ready access to shelter from fast-moving storms? Did many people killed not have safe places nearby to go (e.g., below ground)? Were some people not paying attention or not have access to warning/awareness information, and not know about the high tornado risk on 27 April 2011? What was the general level of severe weather awareness and safety knowledge of many of those injured or killed? Tornado warnings and forecasts are quite good these days with our knowledge and technology, particularly on days with big weather threats over large areas. The watch/warning system did its job quite well on Wednesday. It's also true that there are some situations where people can do all the right safety/shelter actions and still get hurt or killed. But the stunning death toll from the 27 April 2011 outbreak begs many questions, and screams that this is a prime opportunity to study what we as a society can do to further reduce death tolls in weather and other disaster events. In our superior age of information availability, events within the past 10 years like yesterday's outbreak and 2005's Hurricane Katrina seem to suggest that we as individuals may not be as aware or prepared for disaster as we want to think. 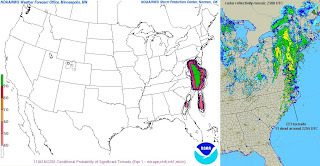 Massive tornado outbreak from OK to NC 4/14/11 - 4/16/11: Why so big? 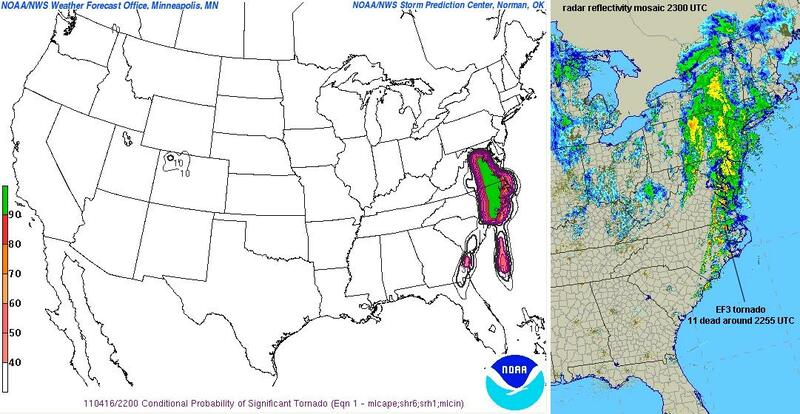 The tornado outbreak last Thursday-Friday-Saturday across the south central into the southeastern U.S. and mid-Atlantic states was pretty eye opening (see photos above). Sadly, more than 30 people died in tornadoes, and there were at least 45 deaths over all from a very strong severe weather system on a 3-day tear. Why so big an outbreak? The 500 mb forecast charts above show a dynamically intense, broad trough in the mid-levels moving from the central into the eastern U.S. during those 3 days, providing plenty of upward "forcing" in the atmosphere. Most of the tornadoes occurred toward the southern end of the system with plentiful moisture (not shown) available from the Gulf and Atlantic. Also on the 500 mb maps above, notice how the mid-level flow intersected the blue lines of storm initiation and orientation at a larger angle toward the southern end of the activity each day, often around 70 deg rather than 10-30 deg seen father north. This orientation of the mid-level flow aloft relative to the surface activity tended to make for more discrete and individual supercells in those areas, probably helping the generation of tornadoes. Low-level storm-relative helicity (SRH, not shown) was also very high in these areas, with values of 600-700 m2/s2 (!!!) from AL to NC during the last 2 days of the outbreak. This helped to support strong tornadoes in environments where MLCAPE was less than 1500 J/kg. A new guideline parameter outputting estimated conditional significant tornado probabilities for more discrete supercells, developed by Bill Togstad (NWS Minneapolis, retired) from a large database of mine utilizing parameters from RUC soundings, performed fairly well in real-time during the outbreak (see last 3 images above). Given that many supercells tended to be discrete on the southern end of this outbreak, the stronger and more deadly tornadoes were mostly associated with probability values of 70-90% or more, as can be seen in the examples above. Along with the size and orientation of the broad upper trough, this suggested very favorable tornadic environments over large areas as the outbreak progressed eastward during the 3 day period. 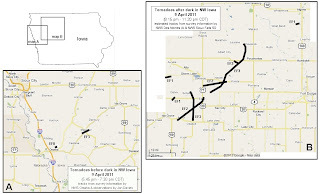 April 9 tornadoes in NW Iowa: Contrasting daytime/nighttime environments? Last Saturday's tornadoes in northwest Iowa with a persistent supercell complex over a period of several hours were quite interesting. The town of Mapleton took a direct hit before dark with a large dusty EF3 tornado developing from a rather high cloud base after 7 pm CDT (thankfully, there were no deaths or life-threatening injuries). Then, after a "break" of about an hour, the same supercell reorganized and began producing several large long track tornadoes during a 2-3 hour period after dark (see nighttime video shot above of wedge tornado near Odebolt, from Shawna's and my storm chase that night). It is very fortunate that none of these tornadoes after dark hit towns such as Sac City or Pocahontas directly (see tornado track maps above). The first weak dust whirl tornado near Onawa around 6:50 pm CDT (see photo above, a "tornado" because it occurred within a mesocyclone both on radar and visually ahead of an RFD, under a condensation funnel at cloud base) was a precursor to the tornado from the same supercell that hit Mapleton about 30 minutes later. The environment at that point had relatively high MLLCL heights (around 1500 m), with an 83/61 F surface ob at Onawa, and a fairly steep low-level lapse rate (approaching dry-adiabatic, see the 00 UTC Omaha observed sounding above) with little MLCIN. The later Mapleton tornado was mainly visible due to thick swirling dust rising from the ground into a wedge shape under a similarly "high" cloud base. The tornadoes after dark were associated with a somewhat different environment (see 02 UTC Denison IA RUC analysis profile above). Low-level lapse rates were no longer steep, and MLLCL heights had lowered to below 1000 m with diurnal cooling while MLCIN of 50-100 J/kg had built in. 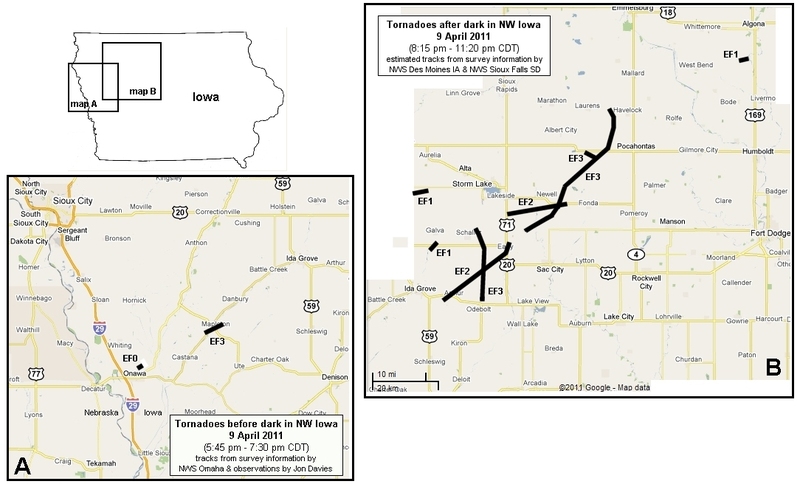 However, the low-level jet had intensified to around 60 kts just after dark, at least doubling the 0-1 km SRH present before dark; according to my colleague Andy Fischer, VAD wind profiles from the NWS Des Moines radar suggested that 0-1 SRH feeding the NW Iowa supercell complex may have actually been greater than 700 m2/s2! Additionally, MLCAPE increased (opposing the typical diurnal trend) as moist advection via the low-level jet caused surface dew points to rise 2-3 deg F. The resulting strong CAPE/SRH combinations (0-1 km EHI > 10) along with large deep layer shear (> 50 kts) probably helped updrafts and low-level mesocyclones overcome increased near-surface MLCIN to support significant tornado potential after dark. This environment matched those ingredients typically associated with tornadoes after dark in the Plains, as discussed in Davies and Fischer (2009). Forecast-wise, this day stood out for 2-3 days ahead of time with consistent model forecasts of strong CAPE and SRH values (see NAM 0-1 km EHI forecast above) coinciding with an area of low-level CAPE (see NAM 0-3 km MLCAPE forecast above), implying a strongly unstable and sheared evening and early nighttime environment that would be relatively surface-based over eastern NE/western IA. The only big question was whether warm temperatures aloft (the "cap", not shown) would spread too far out across the Plains area in SSW to NNE mid-level flow ahead of the deep 500 mb trough in the western U.S. (see NAM 500 mb forecast above) to inhibit convection along and south of a northward moving warm front (not shown). On the morning of the event, however, the NAM forecast of derived radar reflectivity (see above) strongly suggested storms would fire along and south of the warm front over northeast NE and northwest IA around and after 00 UTC 4/10/11. In addition, the NAM 12-hr forecast 850 mb forecast (also above) showed an early evening S to N low-level jet developing over eastern KS/western MO flowing north into the warm frontal area over northwest Iowa, providing moisture advection and convergence along with excellent low-level shear for tornadoes increasing into the early nighttime hours. An Essay: Gustnado or Tornado? 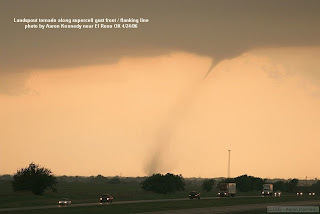 My analysis (previous blog post) of the setting for Sunday's "gustnado" on 4/3/11 near Perry KS stirred up different reactions and opinions as to whether Sunday's vortex actually was a "tornado" or not. Nature certainly defies categories made by man, and there are definite gray areas in classifying tornadoes and small-scale atmospheric vortices. Sunday's "gustnado" was not associated with a mesoscyclone. But a "landspout" (a non-supercell _tornado_ according to the AMS glossary) isn't associated with a mesocyclone, either, and is considered a tornado because the vortex (along a nearly stationary or slow-moving boundary) extends well up into the cloud of the parent thunderstorm, with dust typically extending in a vertical column all the way to cloud base, often under a condensation funnel aloft. Gustnadoes always occur along thunderstorm gust fronts and are more shallow; the AMS glossary definition also categorizes them as "weak" and "short-lived". To my way of thinking, landspouts and gustnadoes are somewhat similar: They both develop from vertical stretching of an area of slow "spin" or vorticity along a boundary, tightening that into a stronger more well-defined vortex. More prolific landspout and gustnado days also feature a steep lapse rate near the ground that enhances vertical stretching as a result of strong surface heating, similar to days where multiple dust devils form over dirt fields from rapidly rising thermals. The main difference between landspouts and gustnadoes seems to be the depth of the circulation, and the type of boundary they develop on. True landspouts (one type of non-mesocyclone tornado) tend to develop with thunderstorms on pre-existing stationary or slow-moving wind shift boundaries that are somewhat more "straight" in the vertical where the tightening circulation can extend to greater depths and last sometimes for tens of minutes. In contrast, gustnadoes always develop on gust fronts, typically faster moving boundaries that are more "curved/sloped" in the vertical, so that the tightening circulation can't extend/stretch as deep and is more transient as the gust front moves/advances. See the diagram above that attempts to illustrate this difference. But.... what if there is a gust front that is not particularly fast-moving and maybe doesn't have so much vertical slope? What if a circulation that develops and stretches on that gust front persists for more that a minute or two, lasting maybe 5 minutes or more? What if it occurs under a high cloud base (for example, above 2000 meters) where it is difficult to see how far the circulation extends upward? What if the circulation becomes rather intense (winds to EF1 intensity) and destroys a small farm building? Do we call this a "tornado"? What exactly is "shallow" and "not shallow", according to the subjective AMS definition? In 2006, on May 23rd, an "outbreak" of gustnadoes occured along the gust fronts associated with a squall line from southeast South Dakota to south-central Nebraska, with many photos taken by chasers. Dirt from some of these extended dramatically to cloud base, with cloud circulation sometimes visible in the shelf above them (see Verne Carlson's photo above). NWS Sioux Falls called some of these vortices "tornadoes" in their local storm reports, while NWS offices in Nebraska did not (look up the SPC storm report log for 5/23/06). Here's another situation the same year, April 24, 2006: A supercell storm produced a mesocyclone tornado near El Reno, Oklahoma. Then, a few minutes later, a non-mesocyclone tornado occurred south along the supercell gust front (see Aaron Kennedy's photo above), which, with little temperature contrast, was barely moving and oriented more "vertical" than "sloped". This tornado had a well-defined condensation funnel with dirt extending upward to it and the clear appearance of a "landspout", even though it was technically on the storm's gust front. From the above, you can see where man-made definitions and categories fail us, and how difficult it is in some situations to decide how to categorize an atmospheric vortex associated with a thunderstorm. I'll certainly admit that there may be a gray area about how to "categorize" Sunday's vortex. The apparent processes involved with the location of the circulation on a rather fast-moving gust front argue for calling the vortex a gustnado. But the high cloud bases and inconclusive photography regarding how far the vortex really extended upward in the vertical also muddy the waters regarding classification. So there's not a clearly definitive "answer", and we may have to accept that. With the vortex persisting for awhile and doing some damage, I can see the desire to call such a vortex a "tornado", and I can't completely argue against that. If that were the only criteria, several "gustnadoes" this author has seen and reported were really "tornadoes". Had there been other tornadoes that captured the video spotlight on Sunday that were clearly supercell/mesocyclone in nature, I doubt that discussion would be so focused on this issue right now. For storm chasers, it is always more impressive to see what is categorized as a "tornado" than what NWS calls a "gustnado". Arguing about how to categorize Sunday's vortex maybe misses the real point. Sometimes, there just aren't exact clear-cut answers, and nature certainly doesn't care what we call something. Perhaps we should just be aware and recognize that there are a wide variety of atmospheric vortices that we don't fully understand or know how to categorize exactly. For research meteorologists, my wife calls this "job security" :-). Big gustnado near Perry KS on 4/3/10 - not a tornado! Sunday's (4/3/10) storms over northeast KS featured a supercell that developed near Manhattan around 6 pm CDT (2300 UTC) north of a surface front. There was enough of a "cap" present that it took northward lift over the frontal surface to initate storms, even with temepratures near 90 F south of the front. As the Manhattan supercell passed N of Topeka and moved into Jefferson County northwest of Lawrence, the gust front extending south of the cell managed to tap very warm surface air south of the front, and a large well-organized gustnado (see photos above at top) formed near the intersection of the surface front and gustfront, east of Perry KS and well south of the supercell's mid-level mesocyclone. Scott Blair has excellent photos and analysis at www.targetarea.net/apr311.html, and NWS Topeka has a good discussion here. The large gustnado (a relatively shallow gust-front vortex compared to a tornado; see diagram above) probably would not have happened if the supercell gust front had not been able to access the steep low-level lapse rate air south of the surface front. On the radar images above (and a radar loop on the Topeka NWS site), you can see where the supercell was intially all north of the surface front. But as it moved east, the extreme south end along the gust front began to pull in true surface-based air near the frontal boundary-gust front intersection. Note that the observed sounding at Topeka prior to 7 pm CDT (0000 UTC, see skewT graphic above), before both the surface front and gust front passage, showed a very steep temperature drop off in the lowest 2-3 km, a lapse rate that meteorologists would call nearly "dry-adiabatic". Such lapse rates are associated with dust devils and rapidly rising thermals on hot sunny days. In this case, it appears that this air helped with low-level stretching along the gust front near the boundary intersection area, creating a rather intense vortex on the gust front. Note on the radar image above that the gustnado location was well removed from the mid-level mesocyclone area of the supercell to the north (the wide video image by Connor McCreary above also shows the shallow gustnado occuring along the flanking line/gust front). I've heard some people online claim this to be a "true" tornado, but real understanding of the cell's geometry shows that it was _not_ a tornado, according to accepted definitions of gustnadoes. 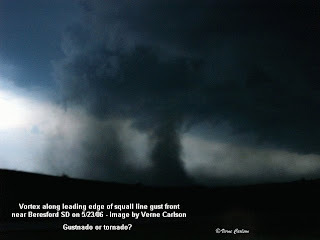 Gustnadoes can also often occur on days with LCL heights above 1600-2000m (like on 4/3/10), while true supercell tornadoes generally do not. I've also heard some people claim Sunday's gustnado was definitely a "tornado" because it had multiple vortices. Well... that means nothing; many gustnadoes have multiple vortices. See the last set of images above taken on a storm chase south of Lubbock last June 14th with my wife Shawna and also Anna and Bill Stromberg. Dozens of gustnadoes occured along a storm gust front that hot Texas day, including some with multiple vortices (see the first 6/14/10 photo by Anna and Bill). Some of the gustnadoes were relatively large, too, with organized rear inflow jets, as can be seen in the 6/14 images. This particular gustnado on 4/3/10 was large enough and well-organized enough to do some damage, and has certainly gotten plenty of air play on TV in view of the lack of real tornadoes that day. Gust front vortices can be very interesting!